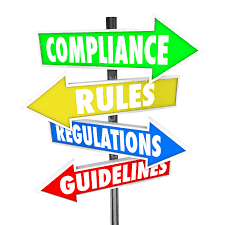 We all live by some rules – legal, financial, societal – and we do know what we’re supposed to do because of them. We stop at red lights, we pay our bills, we say please and thank you, and we take care of our families. But in the world of American grammar, many of the punctuation rules appear to be arbitrary, doing nothing to clarify a writer’s thoughts and ideas for readers. Here are three that I think should be reconsidered, and as they’re part of the American grammar system, they may not apply to you. But if you write or speak in English . . .
1. 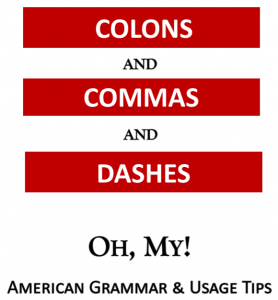 Colons to set up lists: The rule says we do not place a colon after any word that introduces a list in a sentence that cannot end a sentence. Wrong: The box includes: napkins, paper towels, and sponges. Why? Because the word “includes” cannot end a sentence. We wouldn’t write “The box includes” with a period after it, right? Right: The box includes napkins, paper towels, and sponges. Right: There are some supplies in the box: napkins, paper towels, and sponges. The two above are right because the first one leaves out the colon, and the second one has a full sentence before the colon. Seriously, though, how can it matter whether there’s a colon there? Many writers have no idea about the rule, and darned few of us are confused by their sentences when they use the colon. But if you write bullet points under the first part of the sentence, the rule changes from can’t do that to oh, sure. If you want to. 2. Commas connecting separate sentences: The rule says we cannot connect two full sentences with just a comma. We can use a semicolon between them, we can add one of the seven coordinating conjunctions (and, but, for, nor, or, so, yet) and keep the comma, or we can write the sentences as separate ones, each with its own end mark of punctuation. Wrong: Thanks for the reply, I’ll respond later. Why? Because each half of that short sentence is already a complete thought, so the comma is what’s called a comma splice, a real no-no in American grammar! Right: Thanks for the reply; I’ll respond later. Right: Thanks for the reply. I’ll respond later. Right: Thanks for the reply, and I’ll respond later. I can’t figure out why it should matter. No one is ever confused by using just a comma between two sentences, are they? Wrong: “Cathy thinks Tom’s a ‘nerd’ ”. Wrong: Tom thinks Cathy is “weird”. Now, are there any rules that make sense? Yes, at least to me. 1. Direct Address: We need a comma when we’re writing to a specific person, whether we refer to that person by title or name. The rule is called direct address because we’re directly addressing that person. And leaving out the comma can create some unintended humor . . . Right: Thanks for sharing, Susan! Why? Because leaving out the comma makes it look as though someone is sharing Susan . . .
2. The Oxford comma: Using it routinely helps writers be clear when writing a list in which the last two items could be seen as a single unit, even if that’s not the writer’s intent. Wrong: My heroes are my parents, Superman and Wonder Woman. Right: My heroes are my parents, Superman, and Wonder Woman. With the comma after Superman, it’s easy to see that there are FOUR heroes being mentioned; without it, it can and will look to many readers as though the writer’s parents are Superman and Wonder Woman. 3. End marks and internal marks of punctuation and capitalization. I don’t know when early writers realized there needed to be a way to show that sentences or sections in them had ended, or that new ones had started, but along the way they did. Specific marks show the reader that the sentence has ended, and another one has begun. And each mark carries an emotional message as well, even if it’s nothing more than “we’re done here.” The exclamation mark shows excitement, the question mark shows a questioning tone, and the ellipsis mark (the three dots), while not technically an end mark, is often used at the end of a sentence to show a thought that trails off or words left out of an original quotation. They’re all useful to help readers understand a writer’s intent, and before the 19th century and the invention of the telephone, punctuation marks were a great way to alert a reader to emotional content. Are there other punctuation marks or issues with American grammar that don’t make sense to you – or do? Please share your ideas with us here. ← The Devil is in the Details!